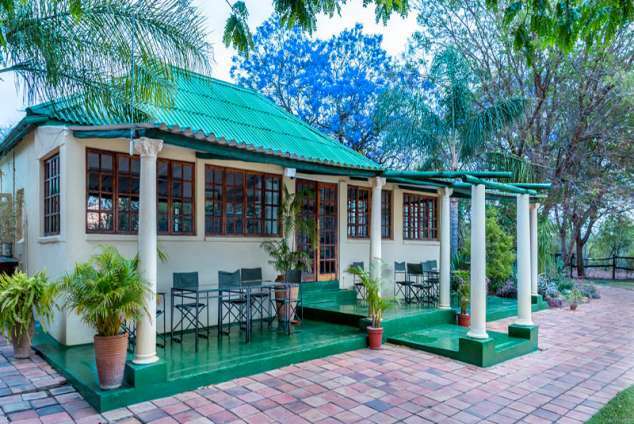 Farmhouse Lodge - Bulawayo Accommodation. The restaurant veranda overlooks the indigenous garden and rock swimming pool, where guests can relax by the poolside or spend the evening around the open campfire in the enclosed traditional boma. Breakfast, lunch and dinner is served in the restaurant, where our chefs specialize in healthy, home cooked meals. On somedays we we offer a Braai dinner. Enjoy food cooked on an open fire whilst sitting outdoors on a warm evening under the stars. Granite Ridge is pleased announce that we now have a brand new conference facility built at The Farmhouse Lodge, offering an ideal getaway conference venue in the spectacular surroundings of the Matopos, and only 30 minutes drive from Bulawayo. The conference room is 10metres x four and a half metres, built under thatch with french doors opening on to the garden and charming courtyard. The Farmhouse offers accommodation for 24 persons, meals in the restaurant, and conference teas and coffees are served in the courtyard. We provide basic conference facilities including flip-chart, and computer projector, and the lodge is equipped with Wi Fi internet services. 2847 page views since 09 Dec, 2013.